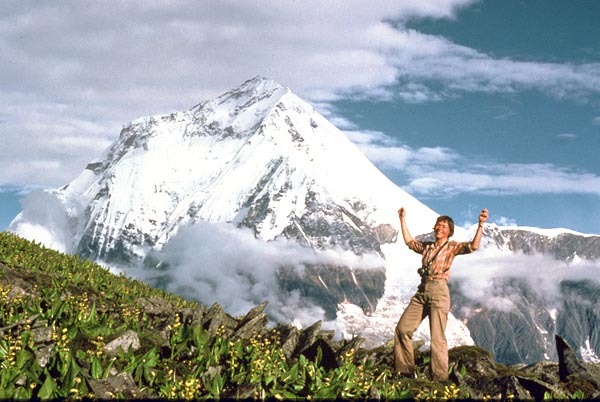 Famous as the first 8,000-meter peak ever climbed and considerably lower than Everest, Annapurna I seemed a worthy objective for our 1978 American Women's Himalayan Expedition. 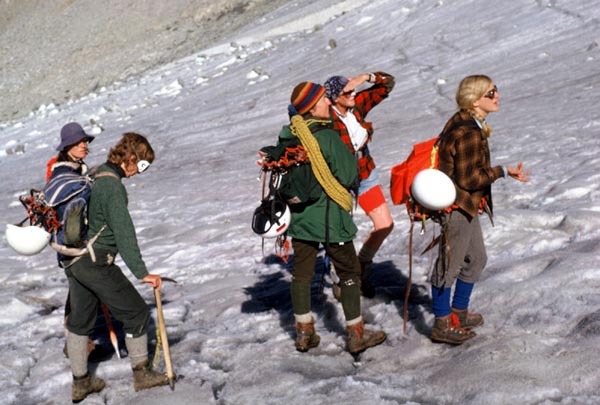 Margi, Sylvia Paull, and I hiked into in the Sierra Nevada for a training climb along with women applying to join our Annapurna team. 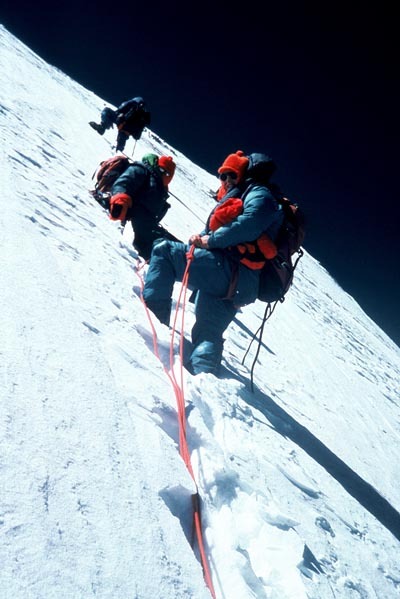 After a few days of climbing together, we could see whether the applicant was a good fit for our team. 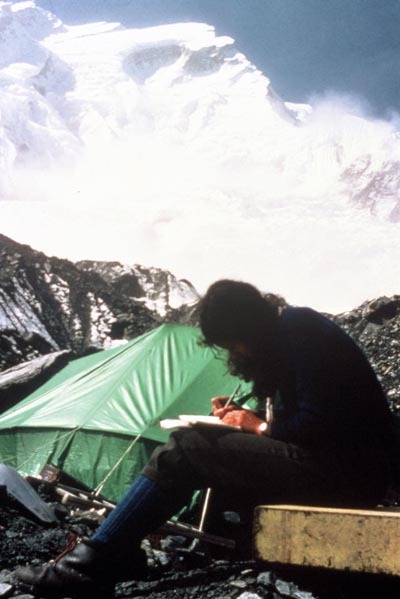 Researching our objective, Annapurna I, 26,500 feet high, I learned the mountain had a worrisome reputation. 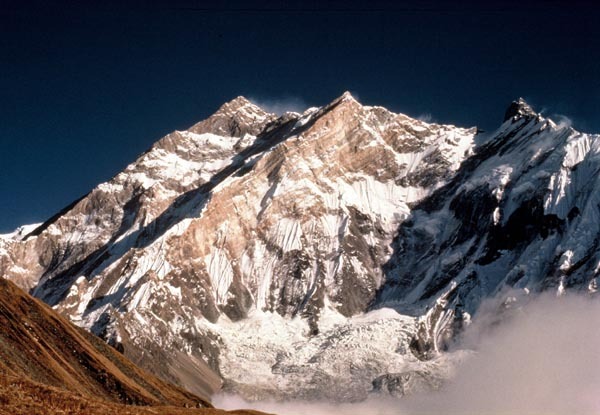 Of the more than 90 climbers who had tried to climb it, eight had reached the summit, and nine others had died in the attempt. 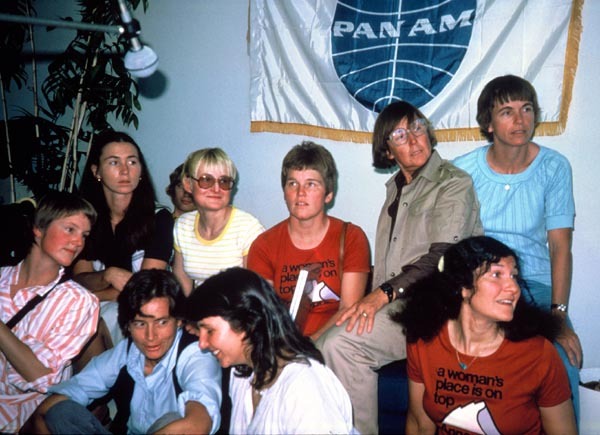 By the time we left for Katmandu, I was the leader of a team of 12 strong-minded women, each of whom wanted to contribute to our decisions. Pelted by the monsoon rains, we trudged up muddy paths to chilly, windswept passes; back down to green terraced rice fields, then up once more. 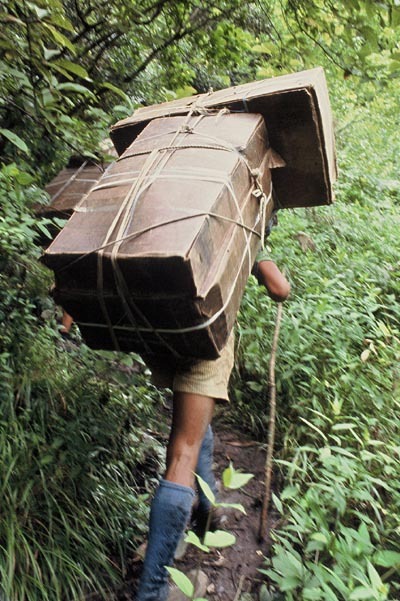 This porter was carrying two loads — or 132 pounds — an amazing burden for a slight man. 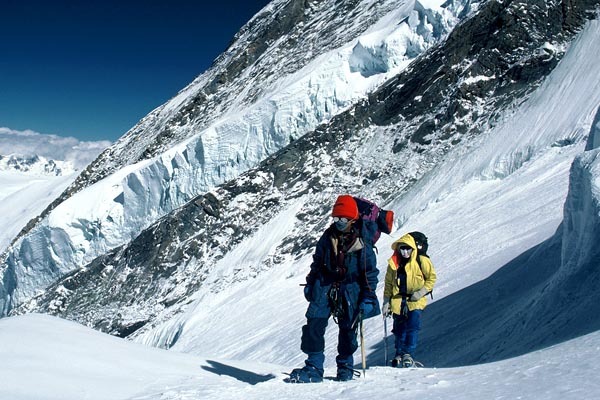 Our plan, to teach these Sherpa women English and climbing skills so we could hire them as high altitude porters, did not succeed. 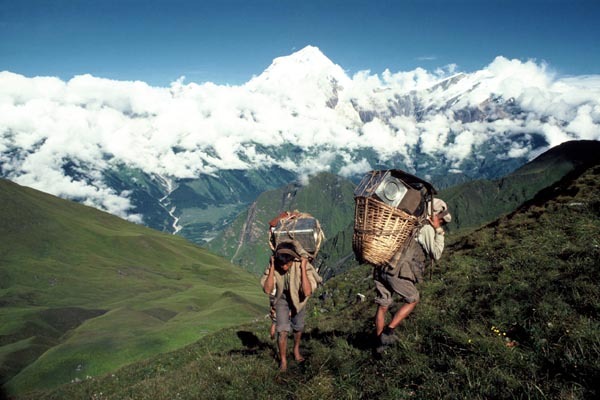 Our high-spirited caravan of climbers, Sherpas, kitchen staff, porters and friends trekked ten days from the town of Pokhara to our basecamp. 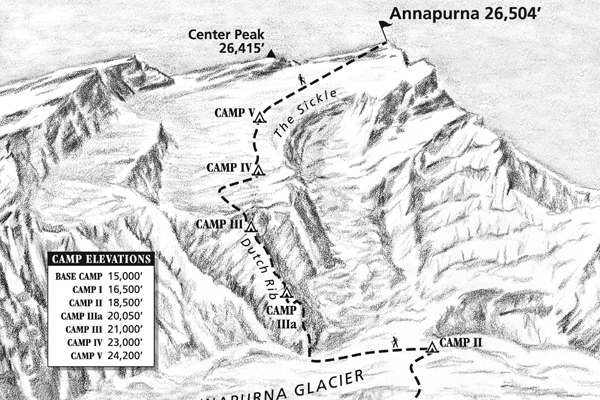 After 12 days of trekking, we reached Annapurna North Base Camp at 15,000 feet. 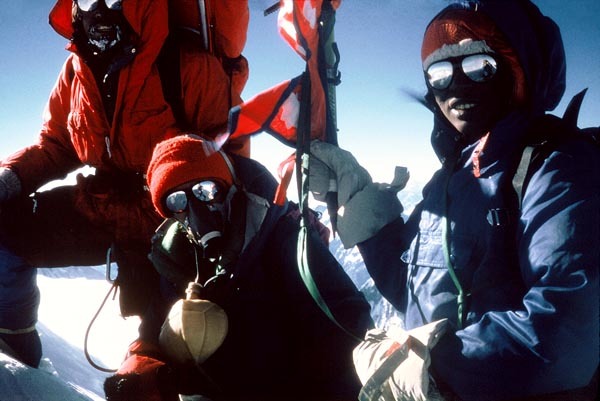 The summit of the mountain loomed two vertical miles above us. 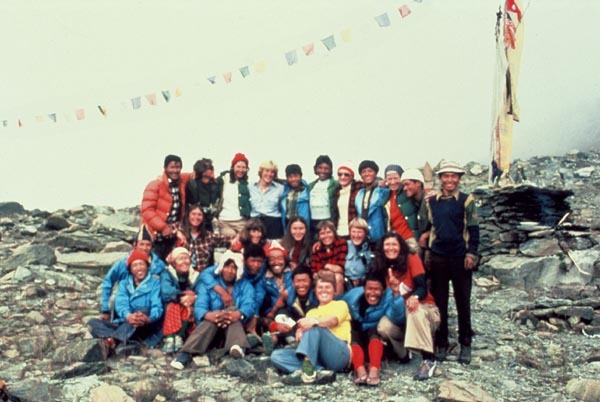 We posed for a team photo at Base Camp. 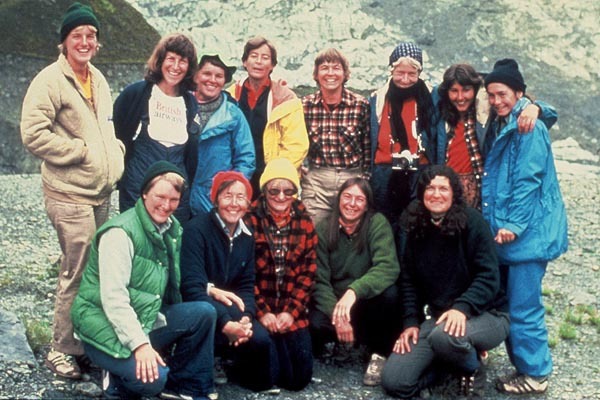 (From left, back) Margi Rusmore, Alison Chadwick-Onyszkiewicz, Christy Tews, Piro Kramar, Irene Beardsley Miller, Joan Firey, Annie Whitehouse, and Marie Ashton. (Front) Dyanna Taylor, Vera Watson, Vera Komarkova, Liz Klobusicky, and me. Dyanna, Marie, and Christy model long underwear donated by a sponsor. Then we took our Adidas tennis shoe product shot. 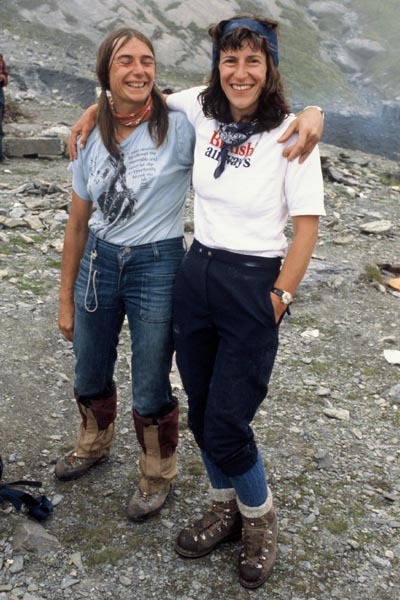 Liz and Alison set off, and a few hours later established the route to Camp I at 16,500 feet. 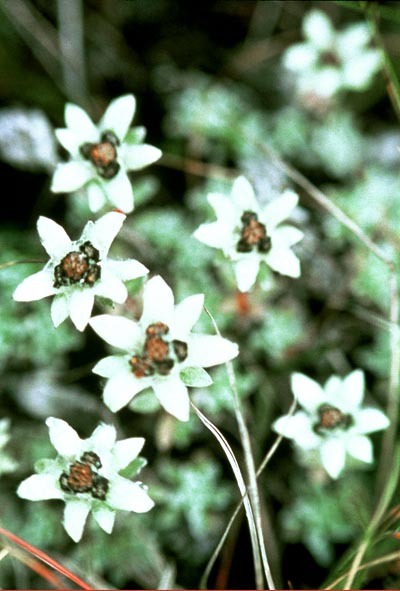 They returned exuberant. 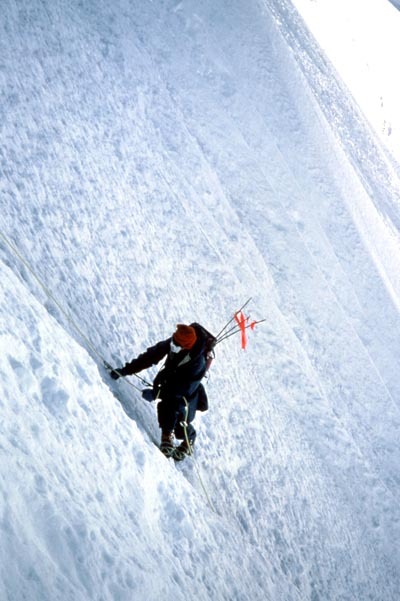 Then the question arose of who was going to lead on the steep slopes ahead. I had to make a plan. 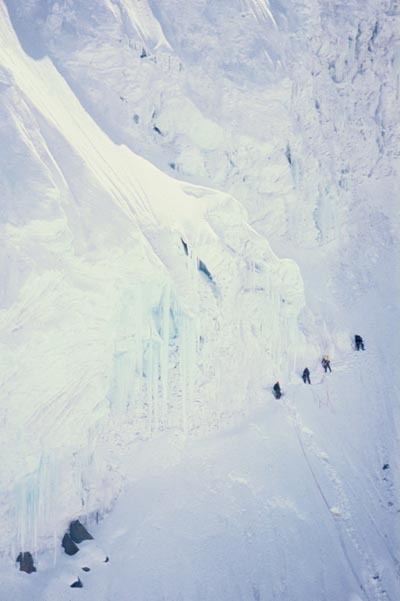 Without consulting the team, I decided that it would be safest for our four best ice climbers to lead. Everyone was dissatisfied with my plan and disgruntled that I hadn't consulted them. After much discussion, the team decided the four best ice climbers should lead, my original plan. But now it was based on consensus and I was reminded that good leaders are good listeners. 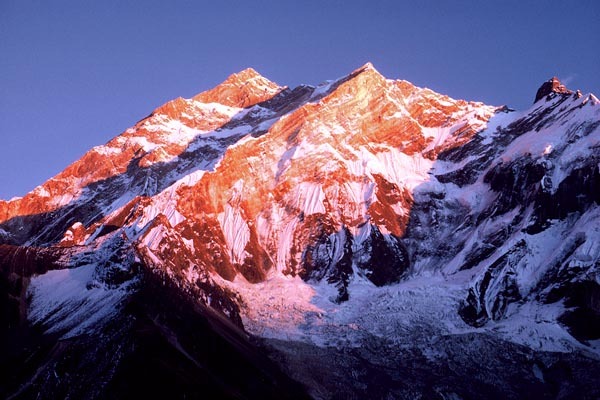 We held a ceremony asking the mountain spirits for a safe, successful ascent. 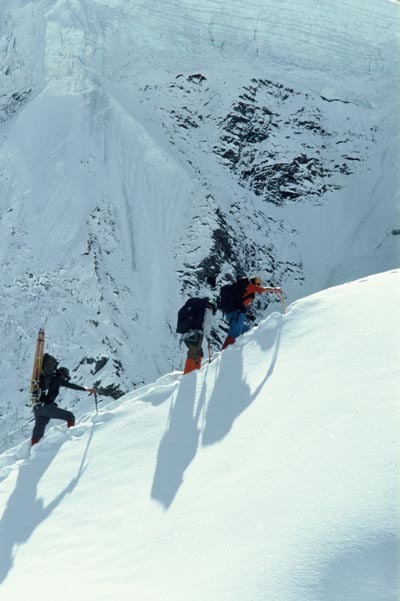 Then we began up the highest slopes as a united team with the blessing of the mountain gods. Without warning, a fierce storm blasted in. 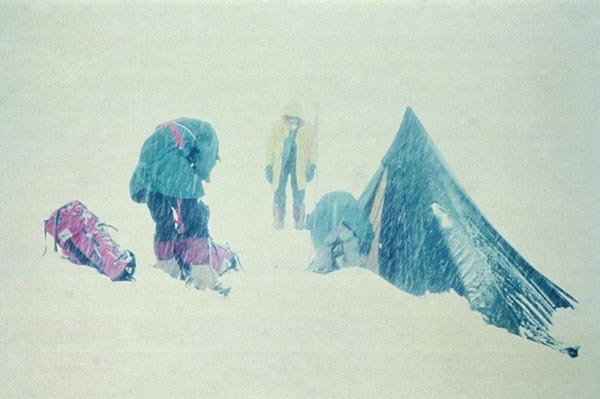 The snow was falling so heavily that we had to shovel off our tents every half hour to keep them from collapsing. 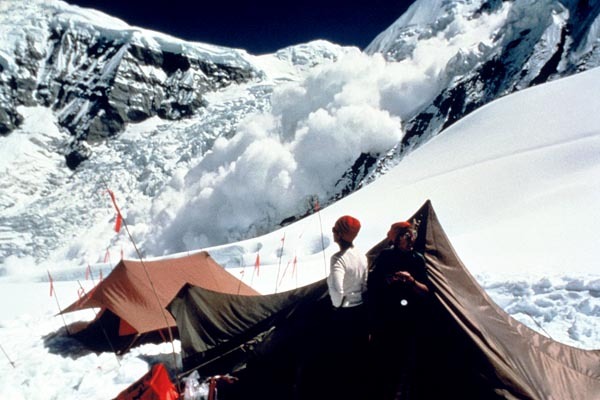 The climbers at Camp II had little choice but to abandon camp and beat a perilous retreat to Camp I as avalanches thundered down all around them. 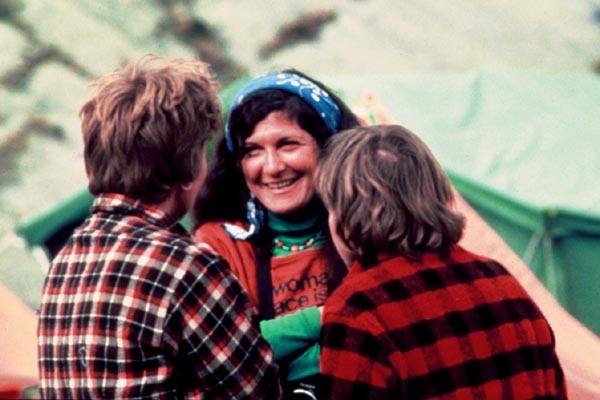 Safely down the mountain, we had a party to celebrate Margi's 21st birthday, Joan's 50th, and all we'd accomplished so far. 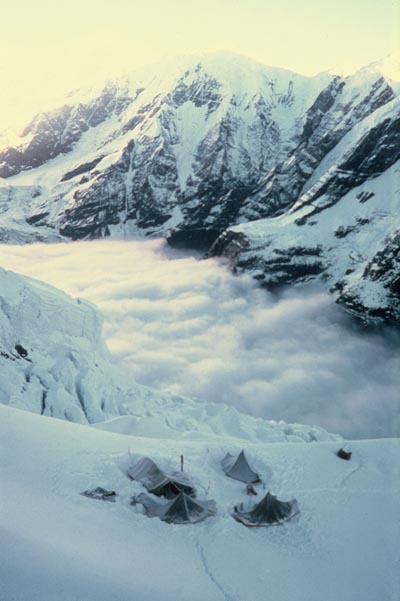 We spent ten days carrying loads to acclimatize and stock the high camps. 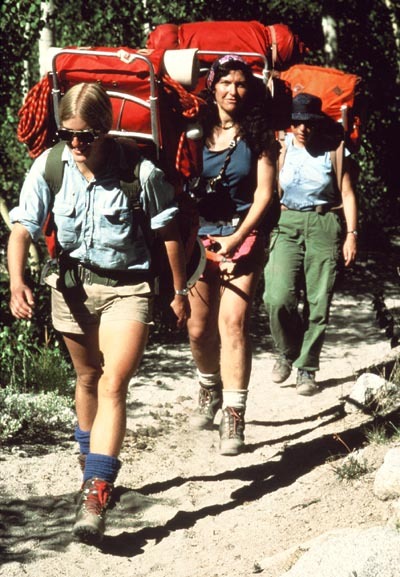 Our film crew, Dyanna, Christy, and Marie, headed up for high altitude footage. 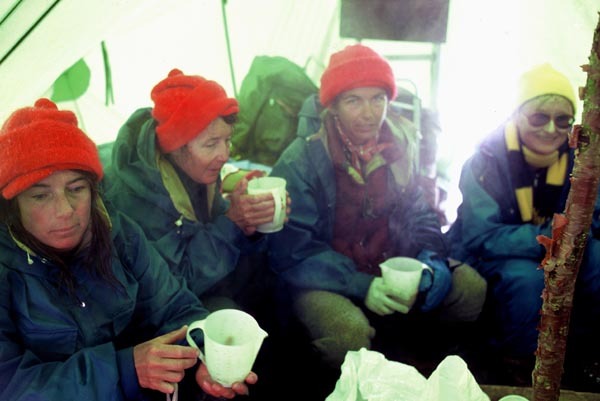 The brilliantly clear morning of September 25, Margi, Annie and I carried the first loads up to Camp IIIa. 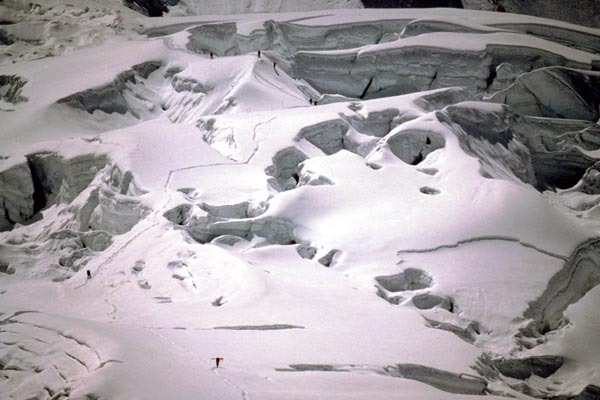 Vera K and Vera W climbed steep ice to establish Camp IIIa, a temporary staging area for the difficult climb along the narrow ridge crest to the permanent Camp III. Our spirits soared as we made it to the crest of the Dutch Rib. 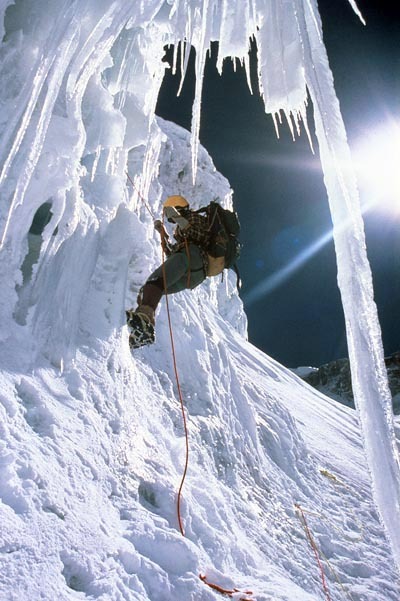 After leaving our loads at Camp IIIa, we rappelled down amidst the giant icicles. 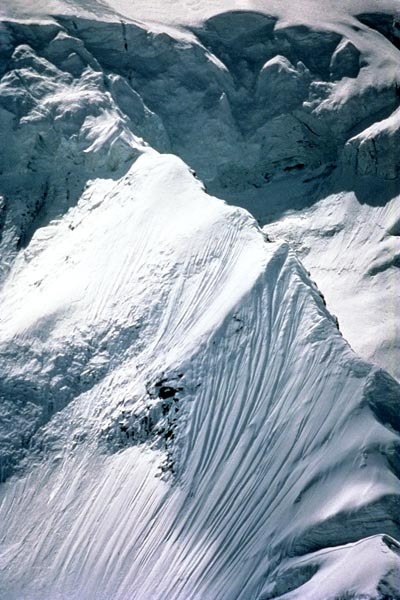 Alison and Margi left at 6:00 AM to minimize the avalanche risk carrying loads up the Dutch Rib. 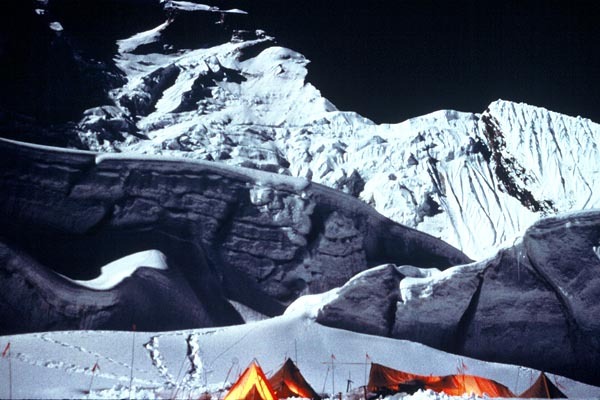 Hearing a roar, I jumped out of my tent to see a tidal wave of snow and ice sweeping down toward the film crew and their helpers. 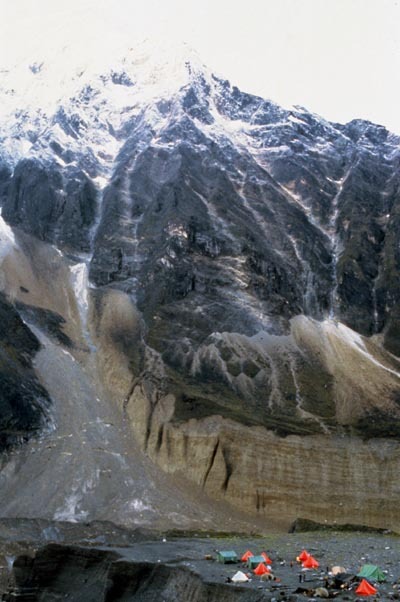 Miraculously, the avalanche stopped just above them. Our next challenge was breaking a trail along the knife-edged crest of the Dutch rib which snaked up like the sinuous tail of a dragon for nearly a mile. 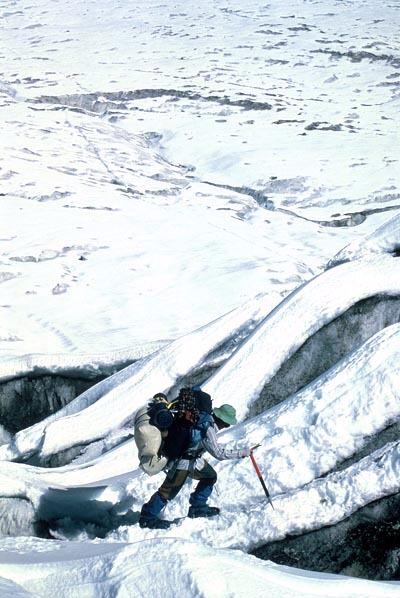 Climbing the undulating rib-crest, we faced soft unstable snow and huge cornices. It was grueling and scary work. 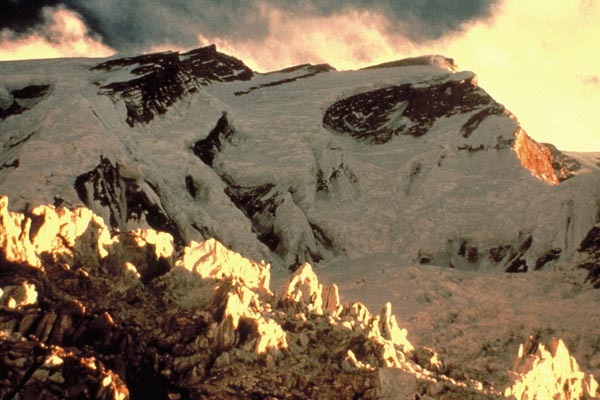 The ridge crest widened slightly to allow us to pitch tents and establish Camp III. 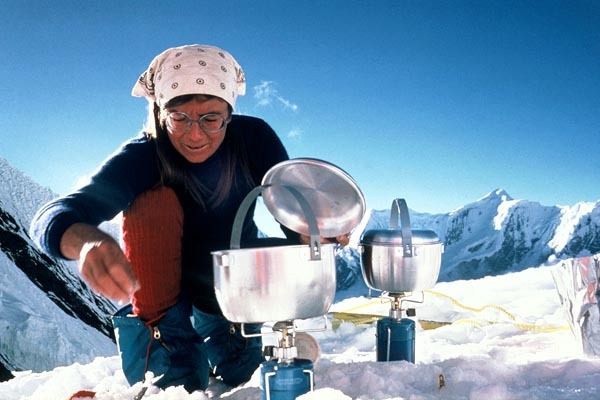 We had to laboriously melt ice for water to drink, cook, and very occasionally wash. I heard a strange new sound — a honking far above me. 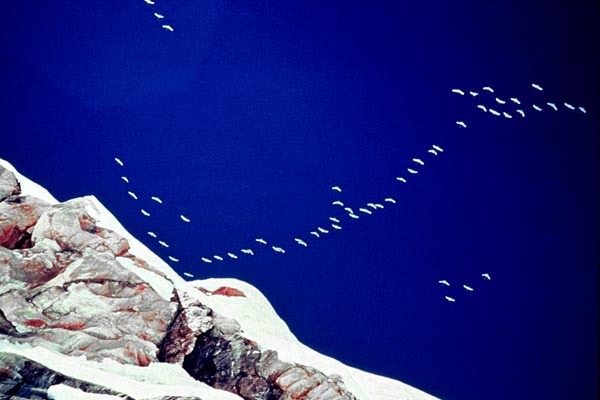 I looked up and was inspired to see a flock of geese wheeling in the sky above the summit of Annapurna as they migrated from Tibet to India. 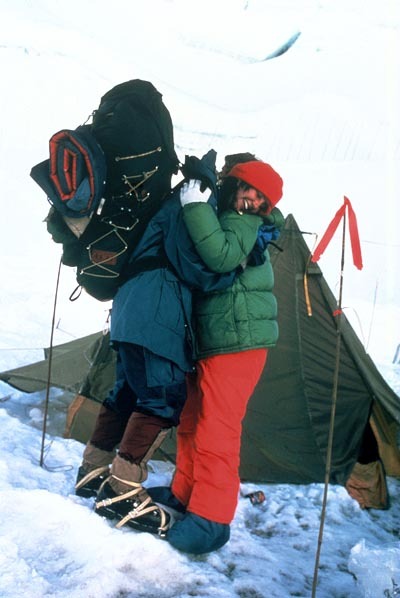 Piro and Irene set off for Camp IV, the first leg of the final push, and I went along to see them off. 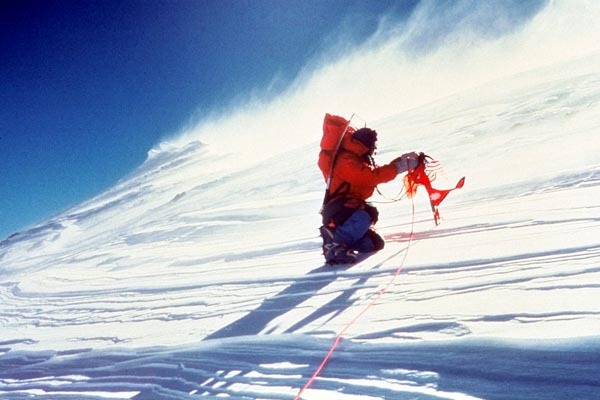 As the others headed for the top, I went down to Camp II by myself, and found myself thinking: "What's a nice Jewish girl from the Midwest doing teetering backwards on a narrow ridge at 21,000 feet?" 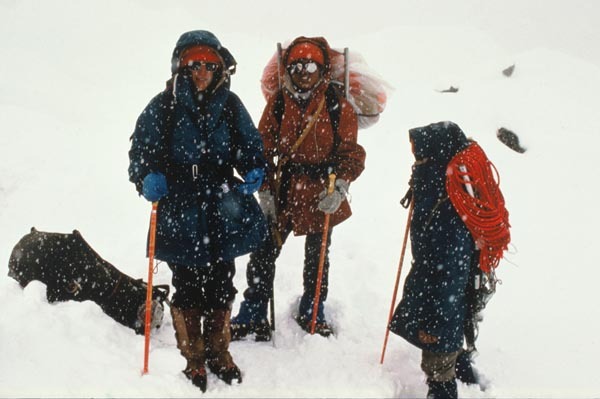 "Just below the summit pyramid, the snow is deep and our pace drags," Irene wrote in her journal of the summit climb. "I think of my family and friends. 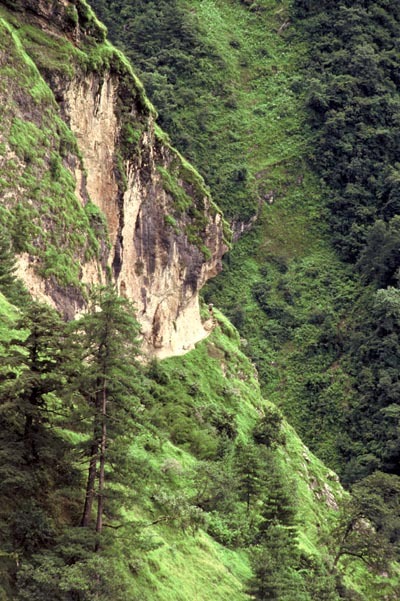 Their love is a steadying force, easing my way up the mountain." 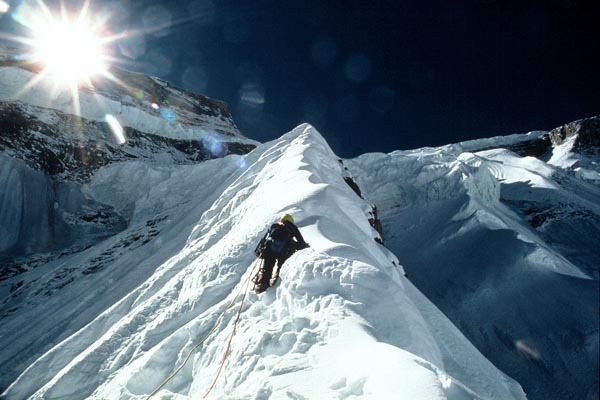 Chewang got summit fever and started racing along the ridge trying to determine the highest point. 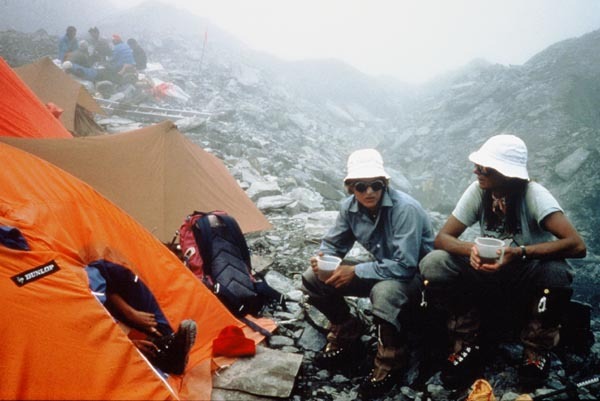 At 3:30 PM on October 15, 1978, Chewang, Irene, Mingma, and Vera K (reflected in Mingma's sunglasses) reached the top of the Annapurna I. They unfurled an American flag, a Nepalese flag, and "A Woman's' Place is on Top" flag, all held together by a "Save the Whales" pin. 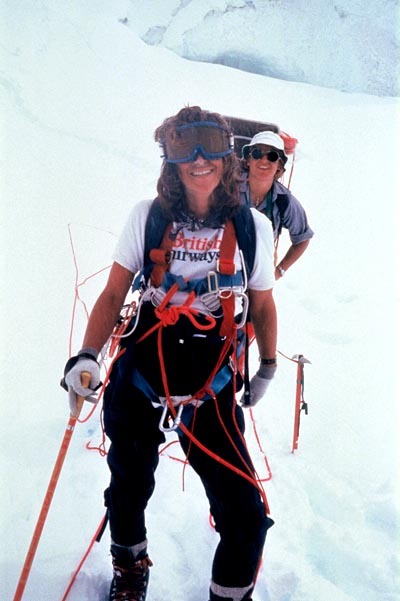 Christy gave Annie the welcome news that the summit had been reached. 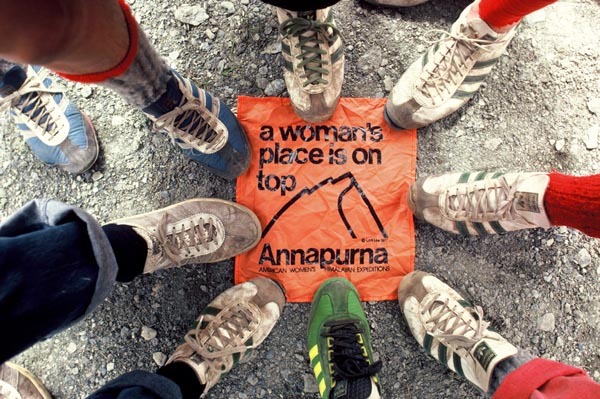 We were jubilant that our team, the first women and the first Americans, had climbed Annapurna. 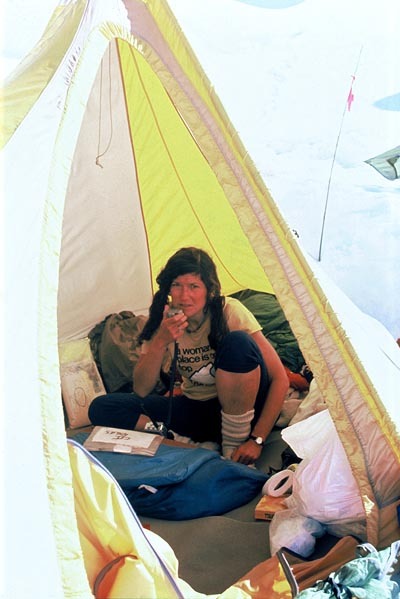 Our second summit team, Vera W. and Alison, were making good progress and had almost reached Camp V at dusk. But that evening they didn't call us on the radio, nor did they respond to our calls. 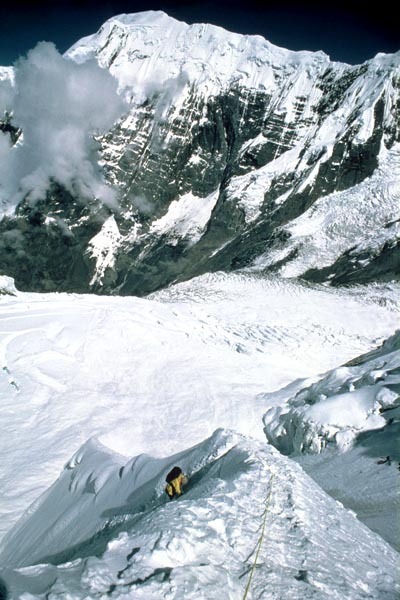 The Sherpas called on the radio with the report that we had dreaded most. 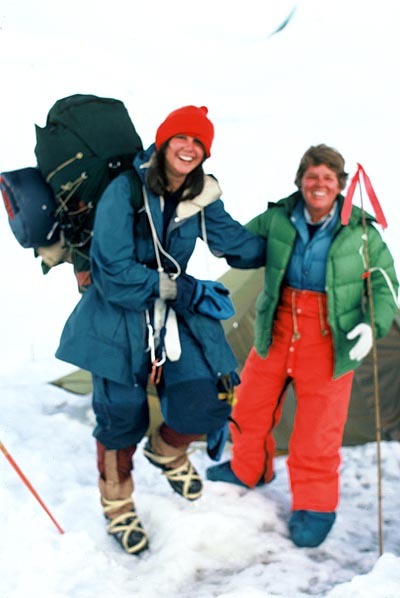 Mingma and Lapka had found Vera W. and Alison's bodies. We found it hard accept the terrible blow the mountain gods had dealt. If only one foot had been placed a little farther to the right. 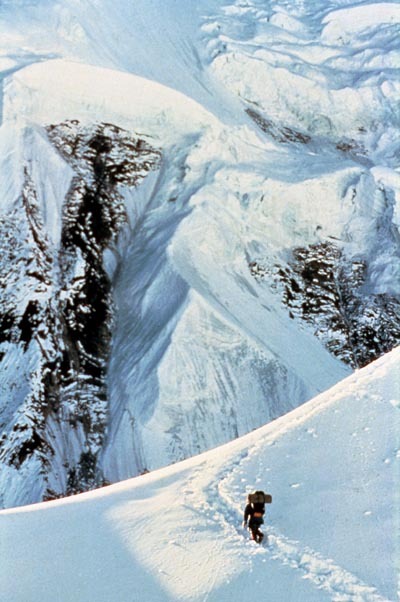 We packed up our huge, heavy loads, and with even heavier hearts we cleared the mountain and made our way down to Base Camp. 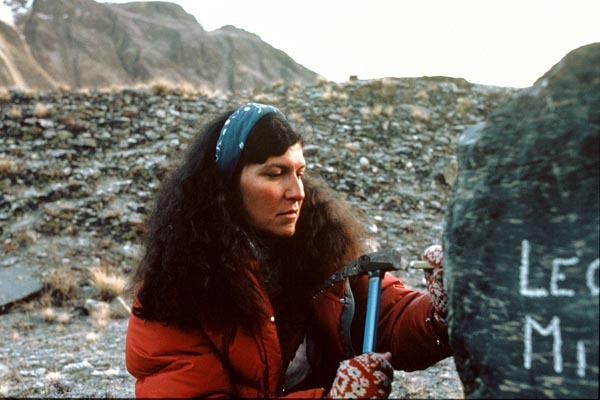 I chipped out the letters of Vera Watson and Alison Chadwick-Onyszkiewicz's names on the memorial stone. 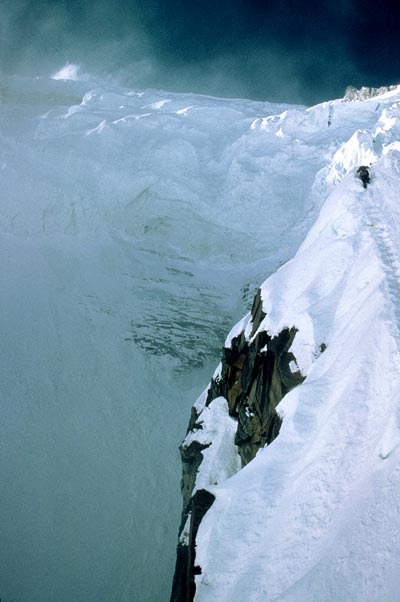 Their names would stay forever in the rock, facing toward the summit they had so hoped to reach. 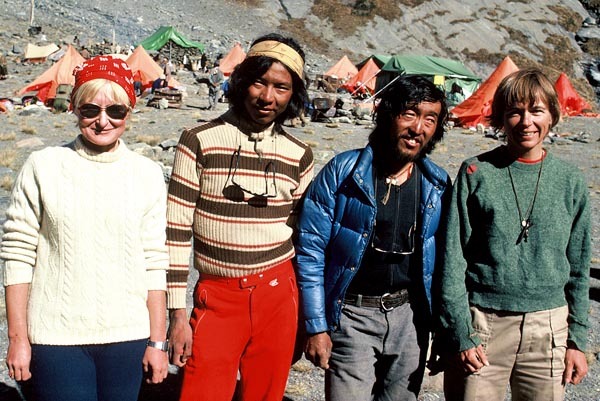 It was hard to believe that Vera K, Mingma, Chewang, and Irene, had so recently stood on the remote icy summit of Annapurna, and harder yet to comprehend our great loss. The greatest reward comes from the greatest commitment. 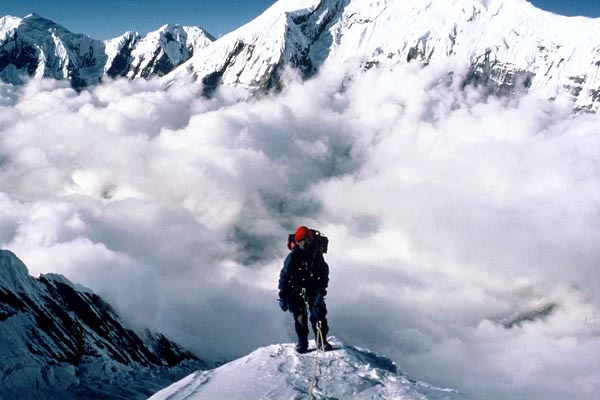 On Annapurna, our team made the commitment and took the risk. 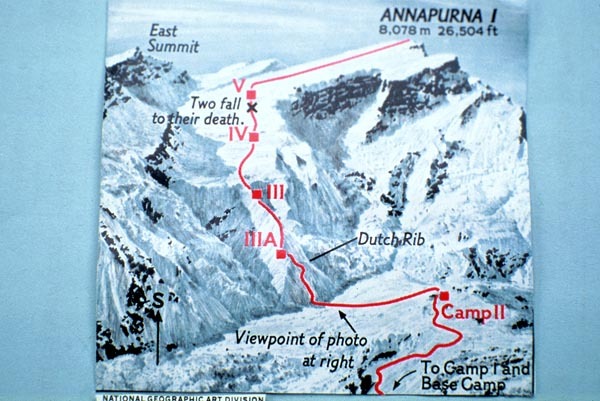 On Annapurna, we learned that life is fleeting and that it is important to live our lives in the best possible manner, cherishing those we love.